MWC 2014 has been the launching ground of a number of smartphone-oriented SoCs, first from Qualcomm who launched the Snapdragon 801, 610 and 615, and then from Intel who detailed Moorefield and Merrifield. Samsung won't be left out of the party though, launching two new Exynos SoCs today. The first SoC is the Exynos 5 Octa 5422, which is a small update to the 5420 we saw in smartphones including the Galaxy Note 3 SM-N900. Like before, it packs four ARM Cortex-A15 CPU cores and four ARM Cortex-A7 cores in a big.LITTLE configuration, with clock speeds boosted to 2.1 GHz and 1.5 GHz respectively. The 5422 supports heterogeneous multi-processing (HMP), as did the 5420, although Samsung says this time the feature may actually be enabled when the SoC is implemented into devices. HMP means all eight cores can run simultaneously, allowing high-performance tasks to run on the A15 cores while low-power tasks are offloaded to the A7s. Other aspects of the 5422 incude a dual-channel 32-bit LPDDR3-1866 memory controller, and a Mali-T628 MP6 GPU, although there's no integrated modem in the SoC. Instead, manufacturers may look to Intel's recently-announced XMM 7160 chip for LTE connectivity. It appears as though the Exynos 5 Octa 5422 will be found in some variants of the recently-announced Galaxy S5, at least according to a Samsung infographic. The Snapdragon-powered variants will be seen primarily, as was the case with the Galaxy Note 3 and Galaxy S4, although some territories will get the Exynos model. 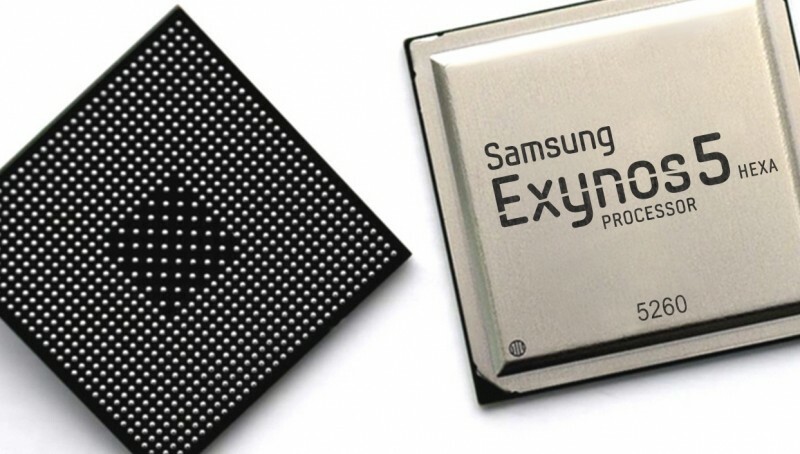 The other SoC announced by Samsung is the Exynos 5 Hexa 5260, which again uses a big.LITTLE configuration. This time we're looking at two Cortex-A15 cores at 1.7 GHz, plus four Cortex-A7 cores at 1.3 GHz, which is a particularly interesting model that might get the best out of the big.LITTLE model, especially when it comes to power efficiency. Apart from the dual-channel 32-bit LPDDR3-1600 memory controller, providing 12.8 GB/s of bandwidth, and HMP support, Samsung didn't share many other details about the 5260. We might see an ARM Mali-T624 GPU, although this hasn't been confirmed. Expect to see the 5260 in the Samsung Galaxy Note 3 Neo when it launches in the coming months.